With more than 40 million inhabitants Argentina is South America’s second biggest economy. For many years, the country operated as a virtual laboratory for the implementation of explicit neoliberal policies, a process interrupted only at the beginning of the present century by widespread public protest. Now, after 12 uninterrupted years of progressive governments, it faces the challenge of either pursuing the current trajectory or returning to the policies advocated by the powerful. Of course, Politics is no exception. Notably during the last ten years, debates on current events in the country take place in almost every social context: from the street to the media, from public networks to institutions. In October, Argentina is to elect a President who will govern until the end of 2019; and so far the only certainties are that, for the very first time in 12 years, the new incumbent will not be a Kirchner, and there will be a great deal of debate. Néstor Kirchner became president in 2003 during the worst economic crisis in the country’s history; a crisis brought about by the neoliberal policies of successive governments which, between 1989 and 2001, adhered to the strictures of the so-called “Washington Consensus”. When Kirchner took office, a quarter of the working population was unemployed, half were living below the line of poverty, and a climate of social violence prevailed that left no room for further austerity. The economic recovery plan initiated by the Kirchner Government was based on two pillars: foreign debt reduction, and strengthening of the domestic market. 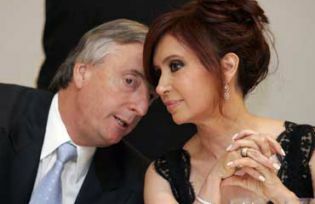 Both policies were accompanied by measures to broaden civil and social rights that were further strengthened after 2007, when the Presidency was taken by Kirchner’s wife, Cristina Fernandez, who was elected twice (2007 and 2011) with more than 50% of the votes. The Kirchner administration also launched a gradual process of re-nationalisation of some formerly state-owned companies that had been privatised during the Presidency of Carlos Menem (1989-99), among them Aguas Argentinas (drinking water) and the Argentine Post Office. The process was expanded during Fernandez´s mandate to include Aerolíneas Argentinas, YPF (oil), Railways, and the pensions system which between 1993 and 2008 had been under the control of private companies contracted to manage the funds generated by workers’ pension contributions. Of course, none of these policies came without political controversy. Every measure adopted by the Kirchners that damaged the interests of those who had benefited from neoliberalism was at once depicted as “radical”, and the government began making the same enemies as other Latin American administrations of progressive orientation like those of Hugo Chavez in Venezuela, Rafael Correa in Ecuador, Lula Da Silva and Dilma Roussef in Brazil, Evo Morales in Bolivia and Jose Mujica in Uruguay. Collectively, these gave the impression that a left-wing hegemony had established itself in the region. If this were not enough, the decision to tax the extraordinary incomes of agricultural exporters, the most powerful sector of the Argentine elite which also owns the most important companies as well as the main media, became a parting of the ways between those who supported the Kirchners (the working class, part of the middle class, and the masses who had traditionally supported Peronism) and those who, despite their failure to offer a political alternative, began working to evict the Kirchners from power. Since the Argentine constitution only allows two consecutive presidential terms, Cristina Fernández, whose Government enjoys an approval rating of around 50% according to all the pollsters, may not run for re-election. Allied to the fact that her role as leader of the Peronist movement is unchallenged, she finds herself effectively in the position of “great elector”. Whoever she proposes as the candidate of the ruling party will probably receive the significant block of votes that Kirchnerism continues to command. Nevertheless, the governing party has not yet settled on a candidate. Seeking the nomination are two Governors , Daniel Scioli and Sergio Uribarri, three Ministers, Florencio Randazzo, Anibal Fernández and Agustín Rossi, and the Chairman of the Lower House, Julian Domínguez. The Radical Civic Union (UCR), a centrist political party and the oldest in Argentina, with a historical record of opposition to Peronism, underwent a crisis similar to that experienced by a majority of the region’s middle-class parties after the rise of the populist governments that shook the representative system in South America from 1999 onwards. Recently, the UCR has decided to contest the coming elections through an electoral coalition with one of the two candidates of the right: the Mayor of the Buenos Aires, Mauricio Macri, a businessman who is the favourite candidate of employers and of the main media. Macri’s party, Republican Proposition (Propuesta Republicana in Spanish), includes among its most important members business entrepreneurs who have become politicians, neoliberal technocrats and heads of NGO’s. Because Propuesta Republicana lacks a national structure, the UCR’s support is critical, since the powers of finance and media acting in concert have proved ineffective in toppling the government despite their best efforts to see off Cristina Fernández. And alone, they would be equally ineffectual in attempting to secure a victory at the urns. The other strong opposition candidate is Congressman Sergio Massa, head of a minority of conservative leaders from the Justicialist Party (Partido Justicialista) who have felt uncomfortable all through the years in which the Kirchners have led the Peronist movement. Massa, who was an official of the Kirchner governments until to 2009 and is now a member of congress for the right-wing Renewal Front (Frente Renovador in Spanish), enjoys significant voter support in some provinces, although some of his opponents have voiced suspicions about his funding sources, and his alleged links to drug trafficking. Seven months before the presidential elections, the electoral scenario in Argentina is fluid, and wide open, something that hasn’t happened in the country for at least a decade. And that single fact is already news. Fabián Rodríguez is a professor in social sciences and a journalist. He has worked in different print and audiovisual media analyzing the relationship between state, political parties and popular sectors of Argentina, in addition to work as screenwriter for film and television documentaries on these same topics. He is currently the editor-in-chief of Télam, the national news agency of Argentina.